Home > Blog > What a Pain in the Back! Odds are that you or someone you know has suffered from back pain in the past year. Low back pain, in particular, is very common affecting four out of five people at least once in their lifetime1,2. A recent survey revealed that, in Canada, back pain continues to be the most common health complaint of people aged 12-443. In many cases, pain may naturally resolve within a few days to a few weeks. However, in others, the pain may persist and become chronic, significantly impacting quality of life and ability to work. In fact, among back pain sufferers, 15% report being away from work longer than one month4. The implications can be even more far reaching – in 2012, a staggering 31% reported limitations that affected their ability to care for their families, complete activities of daily living and enjoy recreational activities that enrich their lives5. The spine is a very complex structure composed of 33 stacked vertebra that function to protect the spinal cord and support the weight of the body while standing and in motion. In fact, the spine is one of the most important parts of your body allowing for support, but also to explore your world through movement. As you can imagine, the spine bears the stresses of our daily activities. With such a complex structure, it can be challenging to find the exact cause of back pain as it may be attributed to a number of interconnected structures, the response of the nervous system and even related psychological factors. Luckily, healthcare providers, including your chiropractor, can perform a comprehensive examination, including ruling out serious pathologies, to determine a diagnosis and recommend strategies for the best course of care. For many, low back pain will subside on its own within a few days or weeks. Yet, for some, pain may persist well beyond the expected time of recovery. Seeking prompt care can help reduce the likelihood of chronicity and can help you get back to the activities you enjoy. Research has shown that for “mechanical” low back pain, conservative care including chiropractic can be effective to reduce pain and improve function7. You can also practice self-management strategies that include staying active, doing recommended exercises and practising relaxation techniques. Ask your chiropractor about self-management techniques that you can incorporate into your daily routine. 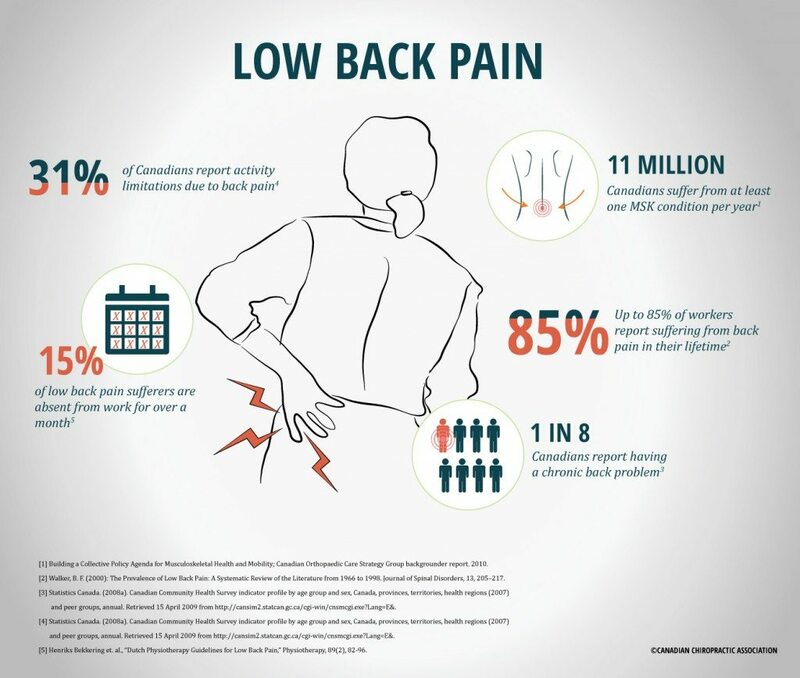 Learn more about low back pain, as well as self-management techniques, and if you’re interested in how chiropractors and other healthcare providers approach lower back pain, check out this great resource from the Canadian Chiropractic Guideline Initiative. 1. McPhillips-Tangum CA, Cherkin DC, Rhodes LA, Markham C. (1998). Reasons for repeated medical visits among patients with chronic back pain. J Gen Intern Med, 13: 289–295. 2. Hicks GS, Duddleston DN, Russell LD, Holman HE, Shepherd JM, Brown A. (2002). Low back pain. The American Journal of the Medical Sciences, 324 (4): 207–211. 4. Henriks Bekkering et. al. (2003). Dutch physiotherapy guidelines for low back pain, Physiotherapy, 89(2), 82-96. 6. Concannon, M. and Bridgen, A. (2011) Lower Back Pain: A Need for Thorough Assessment. Practice Nursing, 22, 458-463. 7. Savigny, P, Watson, P, Underwood, M (2009). Early management of persistent non-specific low back pain: summary of NICE guidance. BMJ. 4:338.